The bathroom might be one of the most intimate rooms in the home, but they are also our sanctuaries. Bathrooms are spaces where we can lock the door and (hopefully) no one will bother us. Whether it’s just a five-minute shower or a long bath with a book and some music, our bathrooms are places to feel restored. But because bathrooms are often small and narrow, they can pose a variety of design challenges. 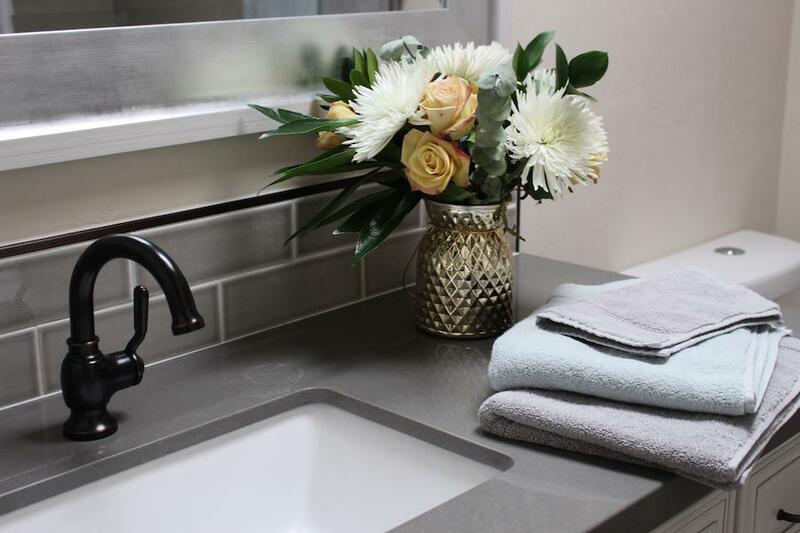 These influencers and entrepreneurs generously shared a range of bathrooms from average sized to chic powder rooms, and essentially full-on home spas as well as their design tips for achieving a similar look in your own home. 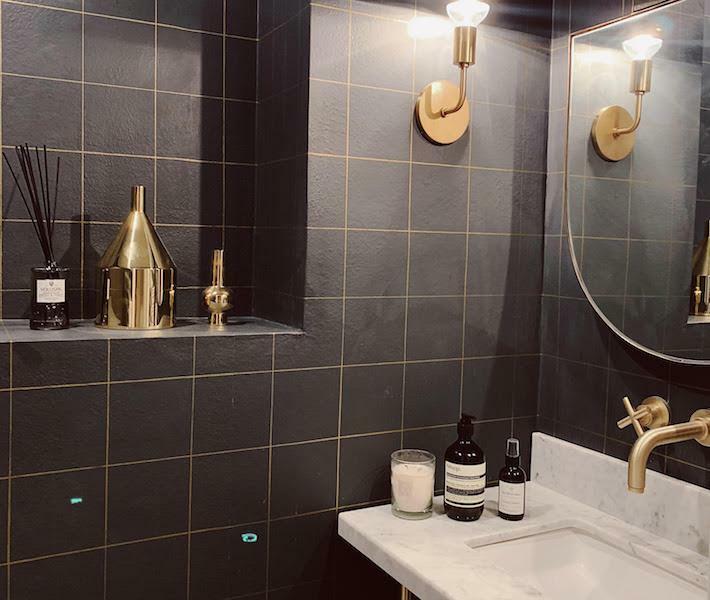 The Digital Entrepreneur and Founder of CINC Studios, Chriselle Limworked with Erick Garcia of Maison Trouvaille to create a dark and sophisticated bathroom. “We used dark wallpaper from Juju Papers to give it a luxe vibe and put in a marble sink with a ton of brass hardware to glam it up,” she revealed. Lim purchased the sconces from Lamps Plus and the mirror from Arteriors. 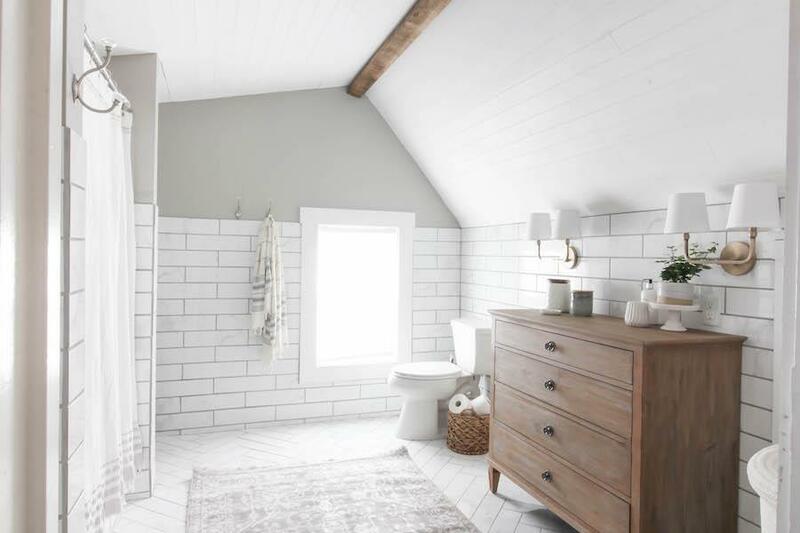 Bre Doucette of the popular interior design blog, Rooms For Rentrenovated her bathroom as part of a challenge with Wayfair. According to the brand, industry data shows the average cost of a bathroom renovation is just under $11k. So, they challenged Doucette as well as other influencers to renovate their bathrooms for just $3k in a period of six weeks. Doucette chose to create her signature country cottage look with every finish and fixture equally chic and accessible from Wayfair. 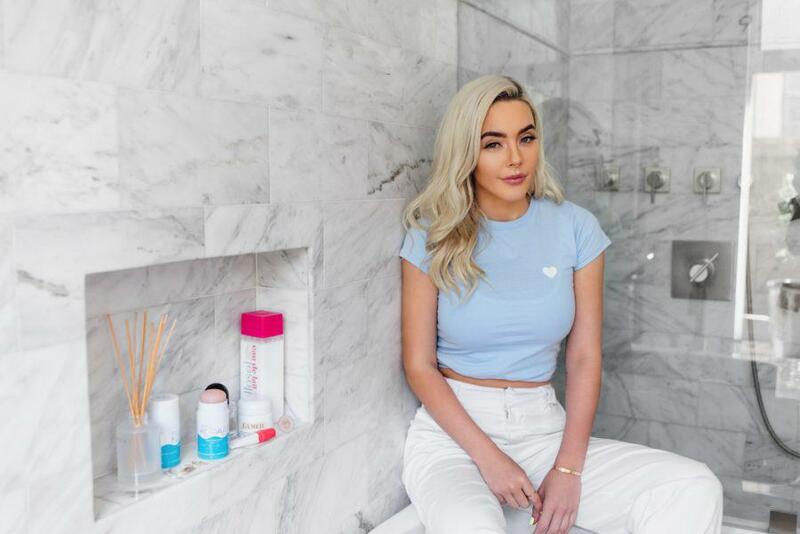 Founder of DERMAFLASH, Dara Levy customized every element of her bathroom. “I have definitely tried to capture a spa vibe. 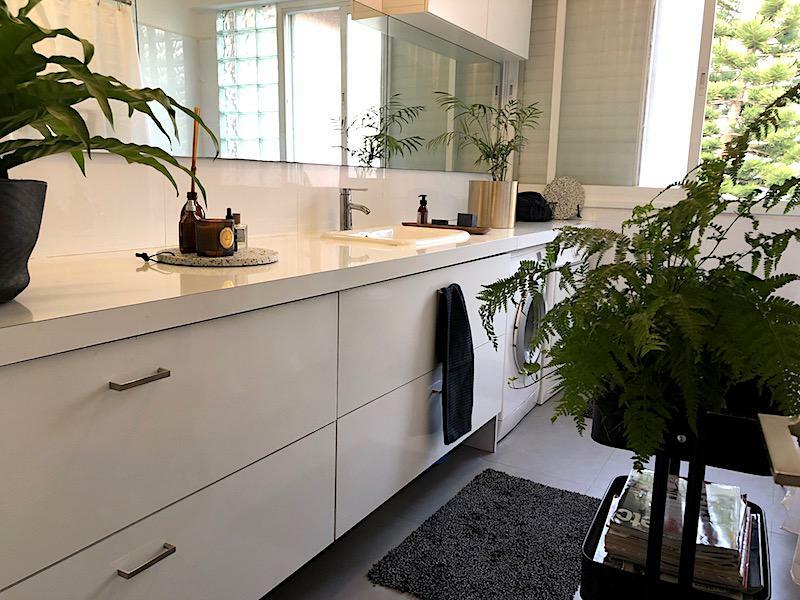 I view my bathroom as a refuge and sanctuary and have intentionally gone for a very tranquil, relaxed feel,” she says. Levy purchased the mosaics from Ann Sacks. All of the plumbing fixtures are made by Dorenbracht. However, what makes this bathroom truly special is that Levy picked up all of the accessories during her travels over the years. The majority of fixtures including the claw foot tub, sink, showerheads, light fixtures and even the bath mats were purchased from Restoration Hardware. But most of the accessories were sourced from the more affordable Target and Home Goods. She designed the entire bathroom herself. “I purchased most the fixtures and accessories from a very cool design shop that imports home decor mostly from Sweden. The plant cart is from Ikea. I love to buy towels. Some are from Greece others are from New York. When I travel, I buy home accessories,” she says. 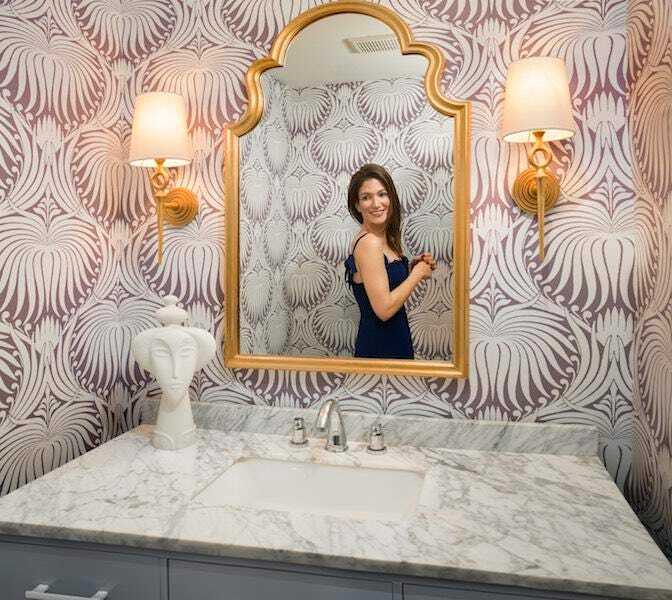 Alexis Rodgers, who is the founder of Home With Alexis, transformed her home’s powder room into a photoshoot-worthy space. She chose large scaled lotus patterned wallpaper in purple to be the backdrop for the mirror and sconces. Then she added gold wall fixtures to elevate the tone of the space. “The overall effect is dramatic and elegant,” she says. 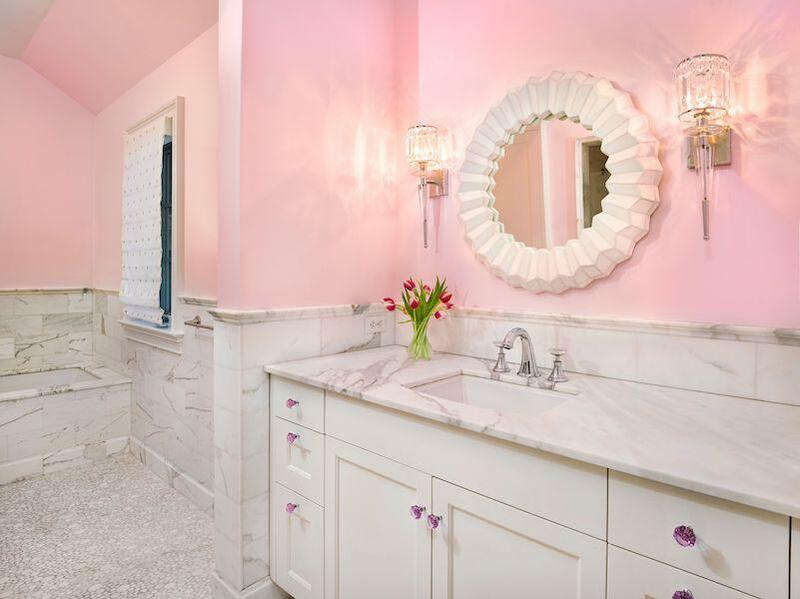 Publicist Allison Weiss Brady has excellent taste, so when it came time to renovate her young daughter’s bathroom, she wasn’t kidding around. Brady enlisted the help of Alexis Rodgers who designed her entire home. Rodgers explained, “We included her daughter every step of the way in the design decisions. We would give her choices and she would pick her favorite from the options. By listening to her feedback, we truly have an outcome that’s out of a girl’s dream. But Rodgers and Brady still wanted to create a space that was adult-friendly. “We kept things practical from a functional standpoint. At the same time, the materials we chose, such as the Swarovski crystals knobs, elevated the bathroom,” says Rodgers. 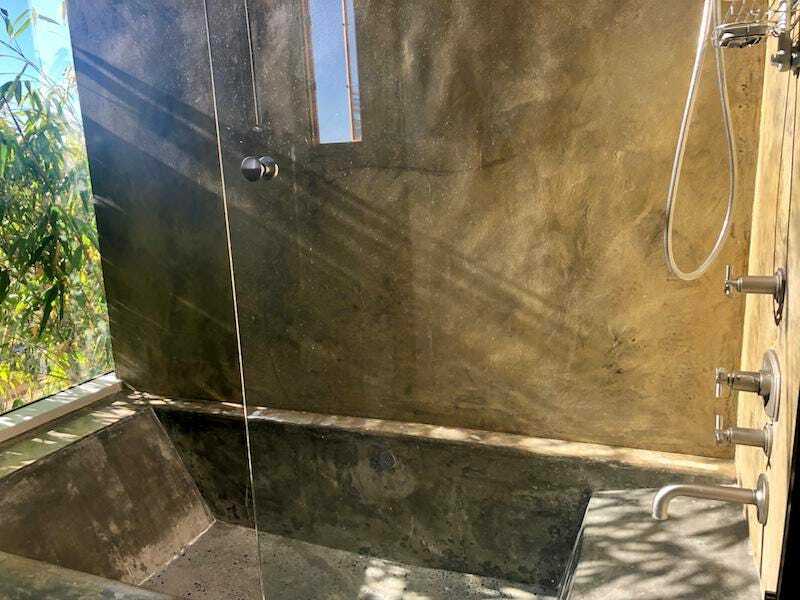 Author and fitness entrepreneur Jennifer Cohen has a true sanctuary off the master suite of her Los Angeles home, which features a sunken metal soaking tub. It overlooks a wall of windows where she can see the blue sky and a stretched green bamboo branch.